Fresh Cut is an inspiring floral show that takes viewers on a uniquely South African floral journey. Join floral communication expert Jill Manson as she invites you to explore the joy that flowers bring. Each episode revolves around a specific theme as Jill meets some truly fascinating people, demonstrates eye-catching floral designs and shares tips and tricks to create your own masterpieces. In this week’s episode of Fresh Cut, Jill explores the world of sweets & treats. Jill shows you how you can design spectacular floral arrangements using sweets and other treats in your designs. These are perfect for a little boy or girl’s party. Fresh Cut, only on The Home Channel. This design is wonderful for a young child’s birthday party. It’s fun and colourful. The sweats add a great touch to the design. 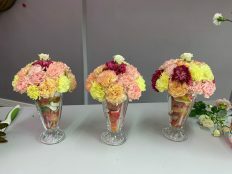 Material: Ice Cream Sunday Glass, Carnations, Edible Sweets, Cluster Roses. This design would be perfect for a little boy’s birthday party; the Proteas add a slightly more masculine feel. Material: Popcorn Box, Proteas, White Carnations. This design would work nicely for a children’s party or a ladies tea party, hen’s party or baby shower. Material: Cone shaped holder made from recycled material, Ranunculus. In this week’s episode of Fresh Cut, Jill explores the outdoors and forages through a beautiful forest area in search of natural flowers and other foraged goods. 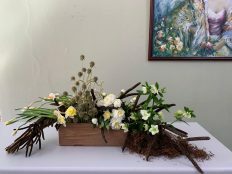 Jill shows you how you can design spectacular floral arrangements by picking from your garden or sourcing from nature. Fresh Cut, only on The Home Channel. Using material found in your garden, forest or nature. This design works perfectly for an outdoor area or veranda. Remember to try and design it where you want to place it, as moving it from place to place can be rather difficult. Material: Flower foam, Tree bark, Wild flowers, Foliage, Grasses. This table design is perfect for a woodland event or rustic wedding. Using material found from nature you can create a “living display”. Material: Flower foam, Peonies, Daffodils, Hellebores, Amaranth, Scabious Drumstick. 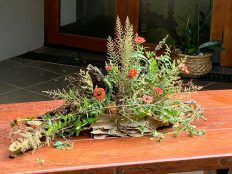 Using dried bamboo, you can create a great vessel for your flowers. This adds a slight modern contemporary touch to a rather rustic country design. Material: Bamboo, Roses, Gerberas, Arum Lilies, Cockscomb, Kalanchoe, Giant Asters, Chrysanthemums, Mini white Carnations, Lime Green Chrysanthemums. In this week’s episode of Fresh Cut, Jill looks at creating designs for a glamorous event or function. Jill shows you how you can design spectacular floral arrangements for a wedding or banquet. Fresh Cut, only on The Home Channel.